A prototype automotive fast charger is capable of providing 100km of range (62 miles) to electric cars in just three minutes. The new fast charge system has been designed by a consortium of automakers including BMW and Porsche. Of course the aim is to make 'filling up' at a roadside station as quick and convenient as visiting the petrol station is today for drivers of cars with petrol engines. As a prototype, there are still quite a few things that the industry needs to get lined up for this vast 450kw roadside charger to work to its full potential. Firstly, the test car required active cooling of the cells in its installed battery pack. Secondly, even the supply cable needs active cooling. Lastly and the most difficult thing to implement is to have so many of these chargers around the road networks that range anxiety can be minimised and queuing is kept to a minimum. As the IEEE Spectrum blog reports, the 450kW prototype charger charges twice as fast as Tesla's highly regarded supercharger system. With the prototype system a car can be charged up to 80 per cent in approx 15 minutes. It is smart enough to ramp down the power delivery for existing vehicles and will "feed just 50kW to the BMW i3, for instance". The upcoming BMW iX3, due out in 2020, will take 150kW. 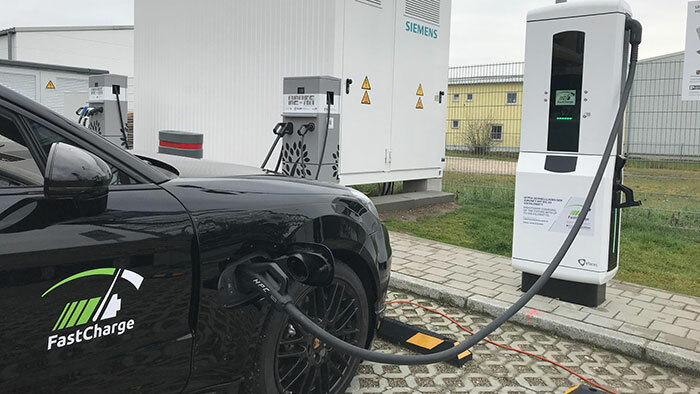 Porsche already has a test EV with a charging capacity of 400 kW initially – a first for a passenger car. The prototypes aren't squirreled away in a lab or on a private race circuit, the Bavarian government has installed two units near the A8 motorway between Ulm and Augsburg. They are free to use for all CCS-enabled (Combined Charging System) vehicles, a standard throughout Europe. Other key players working on the project include; Allego GmbH, Phoenix Contact E-Mobility GmbH, and Siemens AG. BlackFly electric VTOL aircraft brings "Jetson's world to life" Nokia to buy Siemens share of joint venture wireless business Economic news round up European Commission approves acquisition of Siemens Enterprise Communications by Gores Group Siemens SL65, A Forgotten gem? This could very well change the electric car game. I'd imagine it will fall down to how much these cost to implement along with how they'll affect battery lifetime. Fast charging is great, but certainly in the UK there needs to be some sort of work to standardise chargers, how you pay for them etc. Well, the UK could use these Combined Charging System chargers, and give the power away for free, just like this scheme. Tesla will in the future support CCS as well apparently. WOW! if something goes wrong the lithium batteries explode taking a few blocks in the street.